One thing I love about the really low timeframes is some of the unique patterns they create. One of these is the ledge… or multiple bars pushing against one price level creating a short-term support or resistance level. Yes, you can get these on all timeframes, but they form more purely on the lower timeframe… to the exact tick. 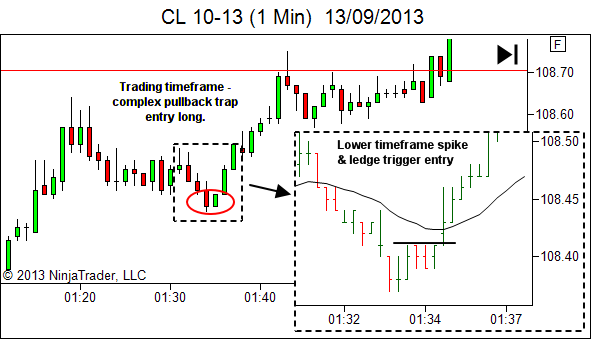 I love ledges as a trigger entry, when they occur in my setup area with narrow range bars offering low risk entries. 1. Don't just look at the above price sequences from a pattern perspective. Look from a people perspective. In fact, this is important not just for this article, but for every price chart I display in every article and video. 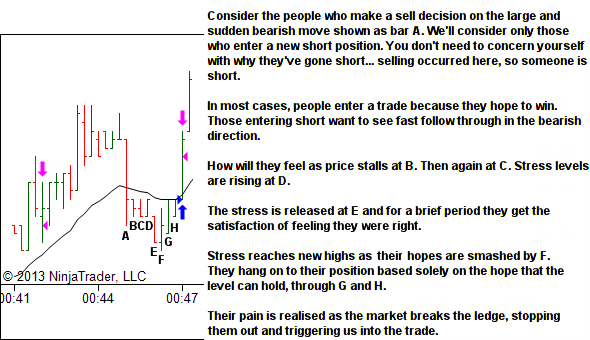 This is one of the central concepts that defines my whole approach – that price movement is a result of trader decision and action in the market – and that the best trigger for short-term price movement occurs at points of maximum pain. Consider the first of the ledge entries above. 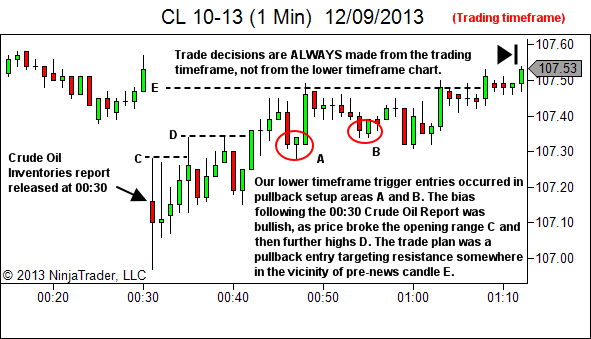 The same concept applies to all price action… in all timeframes. It just operates on a different time scale. 2. Please note that this is a lower timeframe trigger pattern. It's not a setup. You can't just take every ledge breakout. You need to be trading at the right area on the charts. CONTEXT, CONTEXT, CONTEXT! 3. For quite a while now I have operated with two different lower timeframe charts at the same time, one a time (or tick) chart and the other a range chart. Each provides a different perspective and can show information that might be hidden from sight in the other. The following chart shows the same price sequences on a 2-range chart. 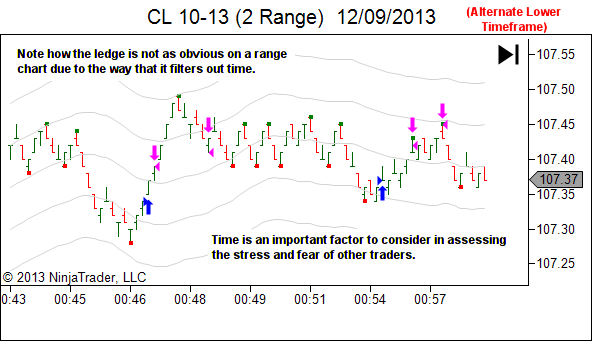 Note how the ledge is not visible to those operating with only a range-chart perspective. See also the YTC Newsletter signup bonus ebook, “The LOST Files – 150 Lost YTC Blog Posts” for the following post: “Don’t Believe the Hype!”. This blog post discusses a similar issue. In this case it demonstrates a fast impulsive move which was visible on the time based chart via the sudden and larger range of the price bar. The same move was hidden on the range chart. 4. And another the next day. Unfortunately this one occurred after I'd stopped trading and and was completing my post-session admin. 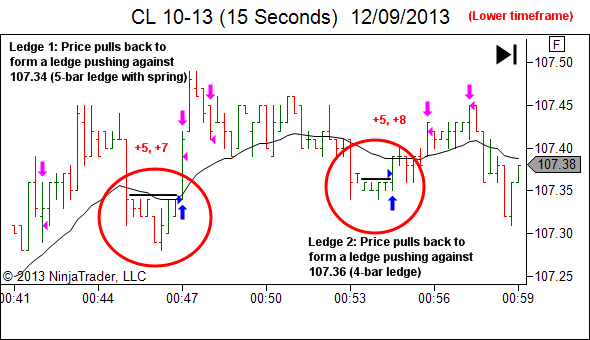 Again, take note of the fact that the ledge trigger entry is only traded within the context of a trading timeframe setup.